RAWALPINDI, Mar 26 (APP):Federal Minister for Railways, Sheikh Rashid Ahmed on Tuesday said former Prime Minister Shahid Khaqan Abbasi was facing the National Accountability Bureau (NAB) investigation due to his bad deeds. the Minister, he had submitted the documents of Liquefied Natural Gas (LNG) case to NAB. The minister criticizing People’s Party Chairman said, Bilawal Bhutto, by gathering just few hundred people, was considering that he was a hero. He said that the Prime Minister Imran Khan would inaugurate the Jinnah Express on Thursday. He said, “The Prime Minister had given me the responsibility of Railways and I am trying to fulfill the responsibility and the Pakistan Railways (PR) was being strengthened so that it could be made financially stable organization. 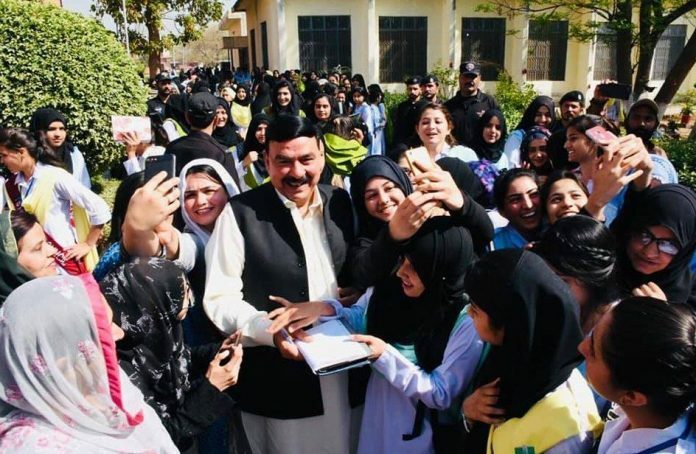 Sheikh Rashid said he was going to visit Quetta, Karachi and Gawadar. Pakistan Railways had purchased land for construction of the Railway Station in Gawadar, he said and informed that the Railways was procuring the land for laying rail track in Gawadar. The minister said PR would soon run another VIP train to facilitate the traders, industrialists, exporters and foreigners. He informed that the Railways authorities had been directed to increase number of cargo trains and to bring a visible change in PR by adopting the latest technologies and innovative techniques. all out efforts for the conversion of the college to a women university. He informed that a post graduate college for women was under construction in Rawalpindi Cantt area and which would be completed within few months. He advised the students to work hard to achieve success in their practical lives and focus on the studies to achieve their goals.